Burnham On Crouch Golf Club – A TSG Review…. It’s often the case that just when you think you’ve played every type of golf course you think there is to play, along comes a golf course that surprises you and forces you to rethink your game. Burnham On Crouch Golf Club in Essex, is one of those clubs…. 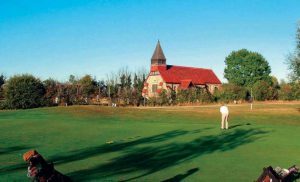 Nestling in the Crouch Valley lies Burnham-on-Crouch Golf Club, a friendly and relaxed members club where new members, societies and visitors are always assured a warm welcome. Situated on the entrance to the small sailing town on Burnham On Crouch, getting here will take you around 30 minutes from the A127 and 40 minutes from the M25 but if you live further afield, its well worth the journey. The Clubhouse has a 60’s seaside feel to it but don’t be fooled this club and course has plenty of history. The main room upstairs overlooks the 18th green and the 1st and 10th tees and is adorned with many Club Trophies from over the years. 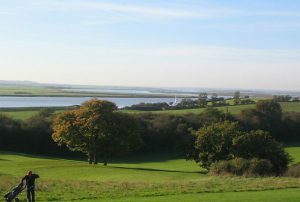 However, it also provides spectacular views across the Crouch Valley and the River Crouch. The bar staff were friendly and welcoming and the kitchen staff will cater to most tastes with affordable snacks and food. Downstairs is a VERY small Pro Shop (enough to fit a desk and a fridge) but chat with ‘Ken’ and he will welcome you with plenty of news regarding the course and the club. Although he was most focused on the weather when we visited, as with most Essex courses, being clay based, they were desperate for rain! Visitors are welcome Monday to Friday, (excluding Thursday mornings) and Saturday and Sunday afternoons. Founded in 1923 and now with over 500 members, the course is renowned for its all year round condition and stunning views over the Crouch Estuary and South Essex Countryside. Originally part of the Creeksea estate, it was one of the twenty-three clubs in Essex mentioned at the inaugural meeting of the Essex County Amateur Golf Union in February 1924. Historically the town was originally a ferry port, and then becoming a fishing port known for its oyster beds, and most recently a renowned yachting centre, hosting ‘Burnham Week‘ at the end of August. The Club was first designed as a 9 hole course but was converted to 18 holes in 1993 after the members purchased land from the neighbouring farmer. The course is now a fully developed track, with no two holes the same. The Club course record is 62 off a Par of 70 from the Whites. The first hole starts with a gentle incline but stay on the left side of the fairway allowing for your 2nd shot over water, to green that is overlooked by the Creeksea Church that dates back to the 13th Century. The second is a gentle short 278 yard Par 4 to the green – drive-able, but stay left. The 3rd offers you great views over the Crouch River with a hole that drops approx 40 ft, to a green well protected by 4 bunkers with plenty of good sand to enjoy. All the tee boxes to this point were clean and well kept and this is maintained around the course. 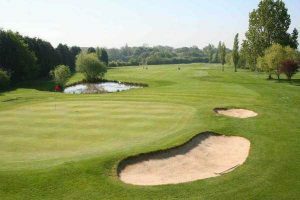 The next few holes offer a good challenge for any golfer and whilst the course is not overly long, you’ll need to be conservative to score well. The next hole worth of a mention is the 317 yard Par 4, 7th, that asks you to play up to a slightly blind, raised green with again good views. Note: a wayward shot here could cost you a 9! The 8th is a very pretty Par 3, again to a raised green, at this point we’ve still not seen anyone else? Surely the golfing mariners of Essex know about this gem of a course? Once back at the clubhouse we putt out on the flat and well-kept 9th green. We then head back out, playing up to the expansive 10th green, protected my a slight ridge at the sides and back. Chip well or your find another bogey on the card. Now the next three holes offer some relief with some picturesque fairways and greens, and whilst not blowing on the day, these may be hard to reach if the wind gets up. With a couple of Par 5’s on the back nine to test the long hitters, the course provides some tree-lined holes and one which is flanked by the local railway. At its end reaches all the way into London Liverpool Street. However, this is not a bother and actually, offers, even more, character to the course. With the next few holes offering some birdie opportunities, the course is an array of different holes with lovely true greens (well done the greenkeepers after a dry winter!). However, one criticism, as with most members clubs, there is NO signage between holes…. why do members clubs not cater to the visiting golfer! This is a fantastic short(ish) course at 6056 yards off the whites and is in great condition that will test your game to the full…overall this is a gem of a course. Reminiscent of a links course, the fact its set back from the Crouch Estuary means it is somewhat protected from the elements but that’s what’s so appealing, it’s different to so many other courses you’ll play in the area or wider county. The beautiful scenery at Burnham On Crouch Golf Club, means is well-worth visiting this club. And with some local history to be enjoyed by way of the ‘Creeksea Church’ this is a course we would recommend you can play again and again. All the staff and members were friendly and welcoming and happy to chat. Will we be back to Burnham On Crouch Golf Club anytime soon? Definitely…this is a course that all TSGers will enjoy! 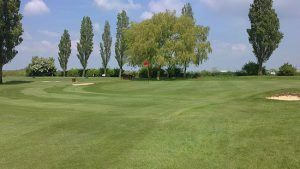 Share the post "Burnham On Crouch Golf Club – A TSG Review…."